So I had my doctors appointment today and it went well. I wanted to get the appointment over with before I gave you all the scoop on what has really been happening these past couple weeks. Starting with St. Patrick’s day, I had a couple of very sleepless nights. I kept waking up every few hours wide awake. I woke up the morning of the 17th and was really tired. I made some scrambled eggs with veggies and some sausage for breakfast. After we ate, as I was cleaning up the table, I suddenly felt like I was going to throw up right then and there. I was afraid that I wouldn’t make it to the bathroom (or the trash can). It passed just about as quick as it came but it still had me wondering. So I took a test, and it was positive. Yes, we are pregnant again. For those of you who haven’t followed me very long, Sleepless nights have been a telltale sign of pregnancy for me. And the nausea had me thinking that I was pregnant for sure. So I called my Doctor and she wanted to keep my appointment but said that it was too early to change it to a first prenatal appointment. 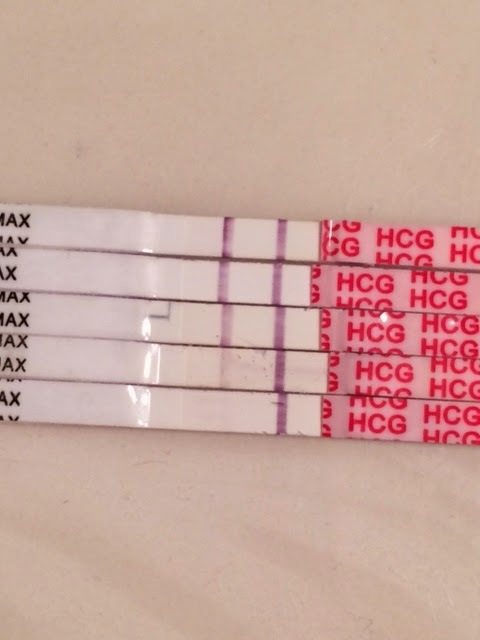 So I have been testing like a maniac this whole time because I have been terrified that I would have to go through everything all over again. I tested every other day with my FMU and so far it looks great (truly it does, yesterday it was darker than the control line). I am getting “growing pains” down there and at first it had me a bit worried but the nurse on call assured me it was ok. I have almost constant nausea, but most of the time it is so mild its not bad, just annoying. If I haven’t eaten for a while I get awful hunger pains and I am VERY thirsty all the time. I have woke up with a couple bloody noses too and its not the weather this time because it is getting nicer now. Now on to the doctor’s appointment. She didn’t do any ultrasounds or anything, we just talked. She told me that it looked like the baby aspirin was doing the trick so she isn’t going to start me on lovenox unless something comes up. My due date as of now is Saturday November 29 but that is subject to change once we get a measurement of the baby. I have an appointment set up for Wednesday April 9 as my first prenatal where we will do all of the paperwork and blood work and the ultrasound. I am trying to be optimistic but it is hard because all that we have been through. Keep sending the sticky baby dust!